Overtime and with the continuous use interior doors receive they will undoubtedly begin to show wear and tear, so when the time comes to repaint them choosing a durable paint that is either semi-gloss or gloss will help improve the finish and ensure it lasts for years to come. Allowing amble time along with following the tips below will help you achieve results that are almost as good as those of a professional decorator. 1) Semi-gloss and gloss paints make your doors much easier to clean while live up to the use and abuse most doors go through, along with frequent cleaning. 2) Use at least two top coats of paint to get a uniform finish and appearance, if the current finish is gloss then you will also need to use a deglosser paint or primer to dull the finish prior to painting. 3) Leave the doors hanging while you repaint them, this will mean you can paint both sides at the same time, while removing the need to lean them against the wall. 4) Removing modern door handles, door locks and latches will only take a minute or two and is preferable over masking. 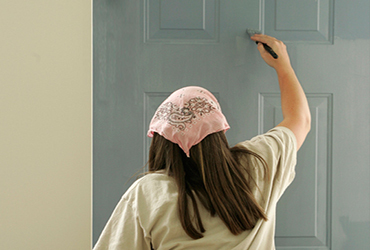 Doing this will result in a better finish and make repainting your doors quicker and easier. 5) If painting new solid wood doors then don’t forget you must seal all surfaces to prevent warping caused by moisture entering the door. If you’ve already hung the new door or don’t wish to take the door off the hinges and out of the frame then use a small mirror to see if the bottom has be painted or not. If not then you will need to do this using a mini-painting pad, or remove the door for better access and ease of painting. 6) If painting a flat door with a roller then bear in mind rollers are best suited to walls and ceilings where the texture looks good however on doors, door frames and most wooden trims it doesn’t look as attractive so use a wide brush immediately afterwards to smooth over the texture created by the roller. 7) When painting panel doors you’ll need to use a combination of brush widths to achieve best results. A recommended method is to paint each panel first leaving the stiles, muntins and rails that frame them until last. The problem with this, is if you get paint on these areas whilst painting the panels then it may set before you get to painting the remaining of the areas. 8) Using paint conditioners will help keep your paint wet for longer, allowing time for you to complete the different areas of the door so they all set and dry at once. Paint conditions also help improve the bond of the paint with the surface of the door, increasing resistance and durability. If you found this article helpful then you may also like to read our post on fitting new interior doors.